We had an emotionally rough time, many ups and downs, listening to San Diego’s homeless stories tonight. The emotion started when we circled up to talk about the night’s goals. Since the Streets of Hope is 100% volunteer group feeding the homeless in downtown San Diego, we often pass around the collection bag to raise money to help pay for the food bags we create every Monday night to pass out. (Tonight we made over 100 bags of food!) While passing around the collection bag, a homeless man named Mike (see the photo), who had circled up with us, reached into one of his pockets and pulled out 75 cents. It was all he had in his pocket. Immediately we all know the sacrifice he was making to help his other homeless friends. It was a touching moment. More on Mike, he was a great friend of Don Angle. 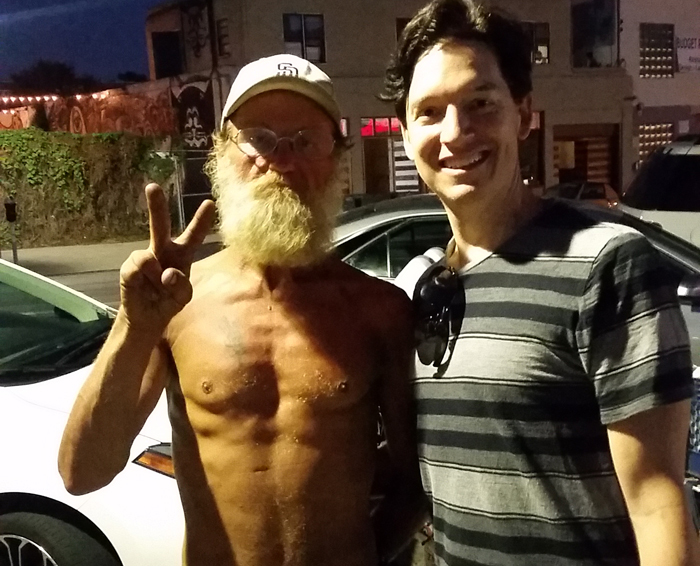 Don was an amazing homeless man who the Streets of Hope got off the streets. Don passed away this year. (You can read about the memorial we had for Don here.) So when Mike reached into one of his pockets and gave all he had, it wasn’t just an emotional gesture; Mike knows, and has seen first hand, the cause he was donating to. He really is a great guy -and a great conversationalist. Thanks Mike for your amazing generosity. Some other homeless stories from this Monday night. On the San Diego streets, near 15th, we met a lady named Ashley and her husband Jose. Ashley is two-months pregnant. It’s always hard to see pregnant homeless women. She was in great spirits and asked us if we had a blanket or a jacket. We weren’t passing out blankets (we do that usually on Special Events). But we did offer for her to follow back to our meet-up point, where we all circle up to talk about the people we encountered for the evening, so we could put forth her request to the whole group. When we did tell everyone her and Jose’s situation, one of the volunteers who had come for the first time, Chris, offered to give her some clothes from his car. That really inspired me – to see someone who had come to serve the homeless for their first time and to really give, sacrificially from the heart. Wow! Thanks Chris. We also gave Ashley our physician contact who will offer his services, including an ultrasound, pro-bono! She left that night with a big smile on her face. We are praying for you, Jose and the baby, Ashley! One other moment from the night; we have to mention Stephen. Stephen is a 40 year old man who went through the Streets of Hope Resume writing service. We didn’t want to see him on the streets -meaning if we do, he’s still most likely homeless. Stephen still hadn’t found a job even though we sent his new resume out to several companies. But what was amazing was his spirit; he couldn’t stop smiling that we had met up again. We encouraged him to keep trying. That’s when a new volunteer to the Streets of Hope, someone who has been coming for only a few months, stepped in. When he heard about how a felony Stephen had was ruining his chances of getting a job, he shared his own similiar experience and how he overcame it to finally be employed. Stephen was super grateful. We all hugged when we parted ways. These are just some of the types of San Diego homeless stories that we encounter every time we serve. Thanks to everyone who came out tonight!